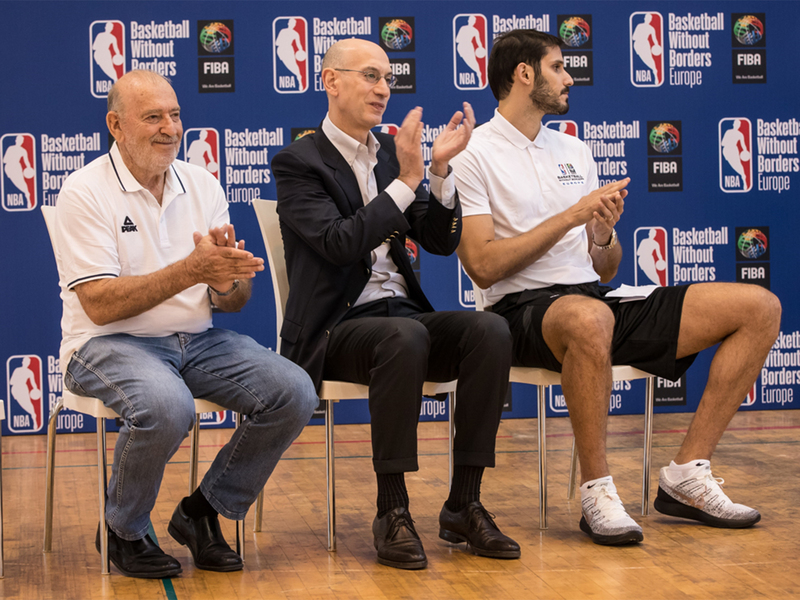 Omri Casspi, who recently joined the Warriors, is prepared to make his first NBA playoff appearance and continue his work as an ambassador for Isreal. On Dec. 28, 2015, Omri Casspi had arguably the best game of his career: The veteran forward scored a career–high 36 points, including nine three-pointers, on the road against the defending champion Warriors. That’s the player the Warriors hope they added this summer, when Casspi joined Golden State on a one-year contract. Casspi is at a crucial juncture in his career. After eight years in the league, most recently a down season that saw him play for three different teams, the Israeli forward might have to fight for minutes this season with the loaded Warriors. Still, his ability to shoot threes—he’s a 36.7% career shooter from beyond the arc—could make him an invaluable role player. 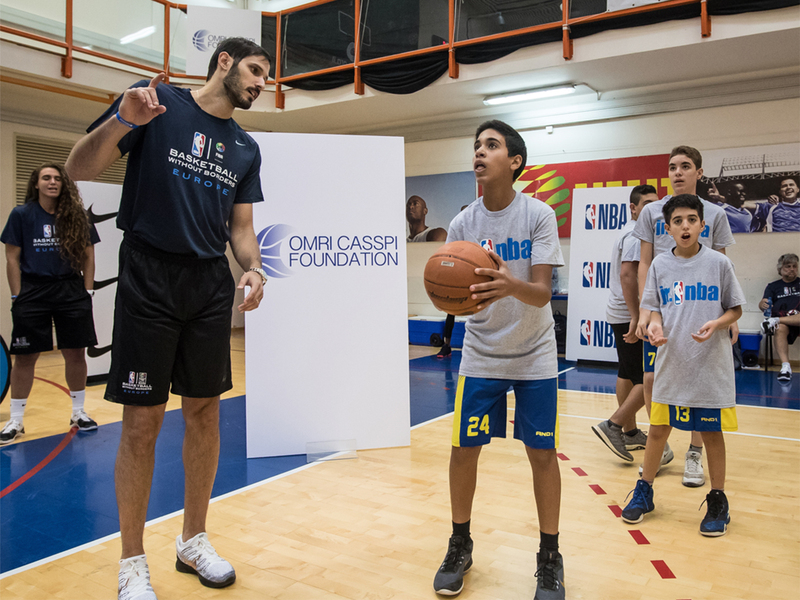 Before stepping on the court for his new team, Casspi traveled to his home country with NBA commissioner Adam Silver, Basketball Hall of Famer David Robinson and several NBA players for a Basketball Without Borders camp, which brought together kids from 22 different countries and a variety of religious backgrounds. SI.com recently spoke to Casspi about the Warriors, Basketball without Borders, representing Israel and more. Stanley Kay: What has the reaction been like in your home country to the news that you’re joining the NBA champions? Omri Casspi: It was crazy. The Warriors—one thing about them, besides the fact that they’re champions—people really love them. They really love the way they play, they love their players, they love their personnel, they love the way the organization is being handled from the ownership down to the GM, coaches and everybody else. And I remember the next day—I went to sleep, and since 6 a.m. my phone was blowing up. I had 400 missed calls, texts from all over, the prime minister, the minister of sport, and a crazy amount of love really. People were really excited about it. And I felt like it’s a dream come true. You have the opportunity to join this caliber of an organization with this caliber of people, of personalities, of people that are working in this organization. It’s just a dream come true, and I’m looking forward to that challenge. SK: What did Bibi [Israeli Prime Minister Benjamin Netanyahu] text you? OC: Yeah, he was really excited. I talked to him, and I talked to the minister of sport on the phone. They said they’re really proud and they’re looking forward to the opportunity of me playing there and coming to watch. It was overwhelming, in a sense. When I got drafted, people were going crazy back home and this was even crazier. SK: You’ve yet to actually participate in a playoff game in your career. How big of a factor was it to join a contender? OC: It was very big. So many times there are good players on bad teams and they don’t get the credit that they sometimes deserve to. I felt that we had years in Sacramento that we played as individuals maybe we played better than as a team. We never really got the credit that we deserved to, and I felt that I’ve been in the league for eight years now, I’m 29, there’s nothing I want more than to win. And there’s nothing that I want more than to help my team win basketball games, whether it’s on the court or off the court. Obviously there will be games that I might play, and that I might not play. So I want to be the best teammate I can be to my teammates, the most supportive and the guy that does all the things that need to be done to help the team win. And obviously great that a team like the Warriors reached out and gave me that opportunity. I’ve been around long enough now to understand what I’m getting into, and I’m looking forward to that challenge. SK: You dropped 36 points on the Warriors a couple years ago. I imagine that ranks highly on your career highlights. OC: No question. It was definitely a night to remember. Sometimes you have big nights, but it doesn’t really happen like that when you go back and forth with one of the greatest shooters of all-time, if not the greatest. It was obviously a night to remember. SK: Say it’s in the end of the game, a couple seconds left on the clock, Warriors down by three. You’ve got the ball, and somehow Kevin Durant, Klay Thompson and Steph Curry are all open behind the three-point arc. Who are you passing to? OC: [Laughs] That’s a good question. I’d take a timeout, I’d think about it. Honestly, I don’t know—they’re all great. Really, honestly, it depends who has the best game. With that caliber of shooters, and as good as teammates as they are, I feel like if one guy got it going, that’s the smart play to do. SK: Or maybe you could just pull up. SK: You’ve been in the United States for eight years now. Have you managed to find good hummus yet? OC: [Laughs] Actually there is. There’s one in L.A. that really resembles home. It’s called Dr. Sandwich. It’s actually an Israeli guy that does really good hummus and really good shawarma. Willie Cauley-Stein Q&A: How Do You Shake the Label Placed on the Kings? SK: At least in my experience at grocery stores, I’ve never found anything like the hummus I ate in Israel when I visited. SK: Obviously you’ve brought a lot of NBA players to Israel over the years. What NBA player would you most want to bring to Israel that you haven’t been able to bring yet? OC: I don’t know, that’s a very good question. I always felt that bringing NBA guys to Israel is obviously great for them to see Israel and to kind of interact with fans all over the world that they have and see the history, etc. But it’s also great for the country. It’s creating a great P.R. for a beautiful country that gets so much bad P.R. at times. My thought was always just helping basketball develop and helping our country have a very good atmosphere and buzz around it. Because it deserves it. SK: You mentioned good P.R. for Israel. What was your reaction when the NFL player Michael Bennett decided to withdraw from a sponsored trip to Israel over concerns that he was being used for public relations? OC: When things are coming out this way, it creates a negativity in a sense. Creating good P.R. is obviously a thought, but it’s not the purpose of the trip. The purpose of the trip is us having fun. And I never ask any of my guys to upload pictures or to talk about Israel or what not. It happens naturally. Because guys are coming and they have a good time and they see the love. We went to the Western Wall on a Friday night one day, and we had thousands of people following us around and taking pictures and showing so much love. I don’t think they ever get love like that anywhere. Sometimes we do work for the communities and bring kids from different communities and do the work, and that alone creates great atmosphere. So when football players decide not to be used, I can understand. He doesn’t need to be used. He’s a grown man, and we’re all grown men. Whether they come in and they like the country or not, it’s up to them. SK: Have you ever encountered a similar situation where maybe a player you invite has concerns about the trip, and if so how do you handle that? OC: No, never, because it was never about it. This is not what it was about. It was always about us going and having a good time, and having a summer together. And sometimes with my teammates, it’s getting to know each other. I had Caron Butler and Rudy Gay and DeMarcus Cousins all coming together and working out, and going to drink wine at night and talking about the season and what it’s going to be like, and what we can do to help the team win. So it’s never really about creating a P.R. It happens naturally because people are having a good time. SK: Was going to the Dead Sea with Boogie Cousins as fun as it looked in that picture? OC: That was a day to remember. We had a great time. SK: On a more serious note, we’ve seen resurgent anti-Semitism in the U.S. The Anti-Defamation League said anti-Semitic incidents were up 86% in the first three months of this year. How close of attention have you paid to this resurgence of anti-Semitism in your adopted home? OC: I always do. I’m always concerned for the wellbeing of my family and the people I know around me and the Jewish communities around the country. I don’t think that what happened in Virginia resembled the U.S. I never felt, in my personal life, anti-Semitism from people, especially in the U.S.—on the basketball court or in my private life. We live in a crazy time. But there’s plenty of wonderful people here in the U.S. that are so much against it. We see the media going against it, and people around the country going against it. Hopefully this will go away as it came around, and that us as people will just come together and banish those who are trying to do those horrible things. SK: One of the people in the NBA who’s been the most outspoken about this stuff is your new coach, Steve Kerr. Is that something that players around the league take notice of, when a coach is willing to speak out? Of course. No question. It’s part of our life. I never really got into politics and stuff like that, but when things of that nature are coming around, you can’t just not appreciate people standing up to that. We definitely appreciate that. SK: You say you’ve never gotten into politics, but you’re the sole representative of Israel in the NBA and there aren’t many Jewish players in the league. Do you feel like when there’s an important issue, whether it’s resurgent anti-Semitism or something to do with Israel, do you feel more of an obligation to speak up, now that your fellow players are speaking up about issues that are important to them as well? It really depends what it is. I won’t get to who the president is, or whatever it is, but anti-Semitism is something that’s above politics. Anti-Semitism is something that I’m always going to stand up against, and be against it obviously and support my people. But I won’t get into conflicts—whether it’s conflicts in politics, the Middle East, whatever it is. It’s not my job. I’m an athlete and I don’t want to get into that. But anti-Semitism—and not only that, just racism in general, people going up against them because of the color of their skin, their race or their religion—I’m always going to stand up against that. But that would be about it. SK: In August, you helped lead a Basketball Without Borders program in Tel Aviv, the first time Israel has hosted the event. Why do you think it’s important to bring together children of different faiths and backgrounds, and why do you think basketball is a good way to do that? Sports in general is a great way to connect people from different communities. I’ve been in the league for eight years, and I’ve been working on bringing Basketball Without Borders to Israel for the past five years. I felt like this year one of the things I was really proud of, besides the fact that it’s so great for basketball in Israel and it’s creating such good attention for basketball and sports in Israel, but we had an opportunity to connect people from different communities outside of basketball. We did so much off the court work, bringing kids from the Muslim community and kids from the Jewish community, and by playing basketball and by talking in different group chats, creating a bridge of connecting people from different backgrounds. So many times, those kids, they don’t have that opportunity before. I felt like kids made friendships for a lifetime.